Dove Canyon is an exclusive gated community developed around a golf course, and homes in Dove Canyon vary from upscale to opulent. Many Dove Canyon homes have views of countryside and Santa Ana mountains. Included within the guard-gated entry is a Jack Nicklaus signature golf club, pool, tennis courts, a small child's park, a wide field, a shopping center, and a reservoir. All of the homes in Dove Canyon are single-family residences. It is located in the Southeastern most foothills of Orange County. Major roads include Dove Canyon/Bell Canyon and Sycamore Canyon. There's a horse trail starts at the waterfalls outside of the community and continues until the end of Sycamore Canyon. View all Dove Canyon homes for sale below, or click to read more about Dove Canyon real estate. You can also search Dove Canyon Bank Foreclosures only or search for other Rancho Santa Margarita CA homes by map. Dove Canyon real estate options consist of single-family homes, large estates, golf course homes, luxury houses, and properties with views of the surrounding scenic landscape. Buyers can also take advantage of the Dove Canyon foreclosure homes, which can be a good deal for the right buyer. Residents of Dove Canyon experience the best that Orange County has to offer, from its mild year-round climate, access to some of the area's best shopping, entertainment and recreation in Rancho Santa Margarita, but also close proximity to the beach cities of Orange County and the National Cleveland Forest as part of the Trabuco Canyon area. Dove Canyon residents pay Home Owners Association fees to give maintenance to the common areas, security and gate, and there's mello-roos. These and the property taxes vary upon the home, so contact us for more information on specific homes. Dove Canyon homes have clean streets, convenient shopping and parks, nearby walking and equestrian trails and large greenbelts. Schools attended by children living in Dove Canyon are located in the Capistrano School District. Residents enjoy the golf, hiking in O'Neill Park, jogging or riding mountain bikes to the top of Saddleback mountain. OCExecutives specializes in real estate transactions of Dove Canyon, California real estate for sale. 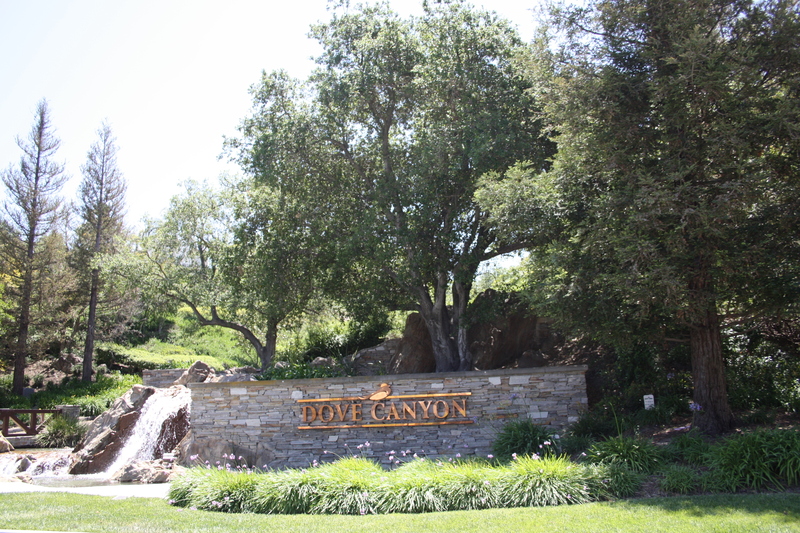 Contact us today to sell real estate or buy real estate in Dove Canyon, California. For more information about any of these Dove Canyon Homes, please contact us. Or if you would like to see a list of luxury homes available in other cities in Orange County, follow the links below, or click here for other Rancho Santa Margarita Homes for sale.